For ither uises, see Gondola (disambiguation). 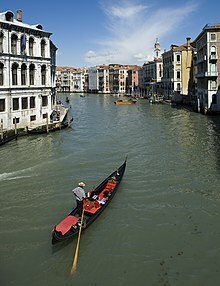 The gondola (//; Italian: [ˈɡondola]) is a traditional, flat-bottomed Venetian rowing boat, well suited tae the conditions o the Venetian lagoon. It is seemilar tae a canoe, except it is narrower. It is propelled bi a gondolier, who uses a rowing oar, which is nae fastened tae the hull, in a sculling manner an acts as the rudder. For centuries, the gondola wis the chief means o transportation an maist common watercraft within Venice. In modren times, the boats still dae hae a role in public transport in the ceety, serving as traghetti (small ferries) ower the Grand Canal operated bi twa oarsmen. For some years thare war seiven traghetti, but bi 2017, the nummer haed been reduced tae three. Various types o gondola boats are an aa uised in special regattas (rowing races) held amongst gondoliers. Thair primary role the day, houiver, is tae cairy tourists on rides at fixed rates. Thare are approximately 400 licensed gondoliers in Venice an a seemilar nummer o boats, doun frae the thousands that travelled the canals centuries ago. Houiver, thay are nou elegant craft instead o the various types o shabby home-made boats o the distant past. ↑ "The Gondolas of Venice — Rick Steves' Europe". www.ricksteves.com.